Tilt and Negative Lift (Operation Tip) | Wiggins Lift Co., Inc. Almost all forklifts include a tilt operation. You can tilt the load back for safety or forward to help deposit the load. Why does tilting the mast back make it easier and safer to transport? Because it moves the center of the load weight back, resulting more stability. When it comes to Marina Lifts there is an added component: negative lift. This, of course, is what allows the forks to get under the boat and lift it out of the water. Because all Wiggins Marina lifts have tilt functions, it is possible to tilt the boat back while the carriage is still in negative mode. This can be a desirable feature, but let’s think about the physics for a moment. When the carriage is in the negative lift range and you tilt it back, you are actually moving the boat forward. This causes the weight of the boat to move forward, which could be a problem when you are at the upper reaches of the load capacity! Some operators use tilt while at negative lift to allow water drain into the waterway, before they lift the boat above the seawall and back out. This is fine, but the best (and safest) practice is to make sure you have raised the boat at or into the positive range before you tilt it back. This keeps the center of the boat weight as fat back as possible. The water still drains into the waterway, but in a much safer and more stable manner. Feel free to comment below with your own operator tips or best practices. If you’d like to write a guest post about a tip, best practice, industry news, or any forklift-related matter, contact us. 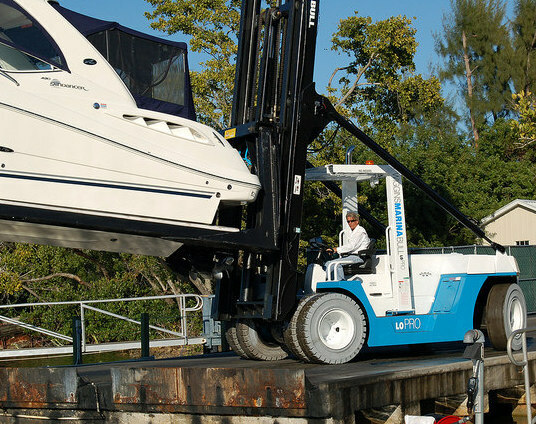 We are interested in purchasing a Wiggins marina forklift and would like to know some specific pricing. May you please email me this information.